It’s been over 20 years since the birth of the Tino Rangatiratanga flag with Rangitaane Marsden citing its launch date as the 6th of February 1990. Now it has been adopted by many and flies in places of significance across the nation. Rangitaane Marsden says “the flag in a sense reflects the creation story but if you take it to another level black reflects the potential, red reflects the realities and white reflects the wisdom and illumination that come with a persons own individual being”. 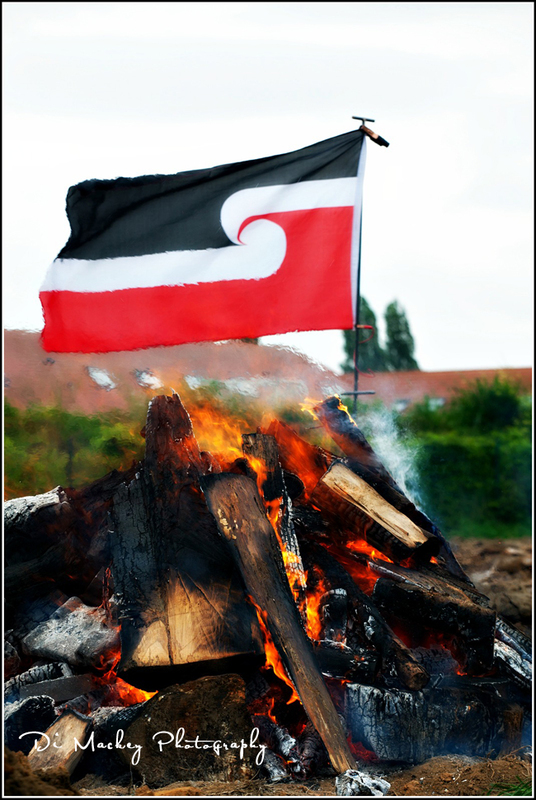 Source: Māori News, the Origins of the Māori Flag. I spent most of yesterday outside in a field near the Peace Village, photographically documenting a Hangi. The image below was taken while they were still heating up to tiles used in the hangi pit. It was a stunning fire ... one that burned so hard and so long. I was fascinated. Thank you, so much, to Lenn Krosschell and those helping him for allowing me to hang round and take photographs. And there in the background, the Tino Rangatiratanga Flag blowing strong in that Flanders Fields breeze.